IS IT WORTH THE TRIP BACK? Finding out your forgot groceries at the grocery store can be a big pain but it’s also money out of your grocery budget. Whether you decide to make the trip back to the grocery store if you forgot groceries you paid for depends on a couple of factors. I know we have in the past forgotten something at the cash register because we weren’t paying attention or the cashier didn’t send it down the chute or conveyor. (That’s what I call it). Sometimes items get stuck and if you or the cashier aren’t paying attention a product or many products might get missed going in your shopping bag. Luckily we were in the parking lot when we noticed some of our groceries were missing. Now we seem to go through the self-checkout which makes it a bit more difficult to forget anything because it all has to go on the weigh scale once scanned. You are in charge of your groceries. Depending on what time of the day you shop it can be chaos at the grocery store so things are moving quickly and if you aren’t alert you can miss groceries you paid for or potentially a scanning code of practice (SCOP) on a product. The good thing about SCOP is worst case scenario when you get home you telephone the store and talk to customer service. Let them know about your SCOP and ask them if it’s OK with them when you come in next if you can have SCOP honoured. An all too common scenario is when you are in the kitchen putting your groceries away only to notice you are missing some products you know you bought. 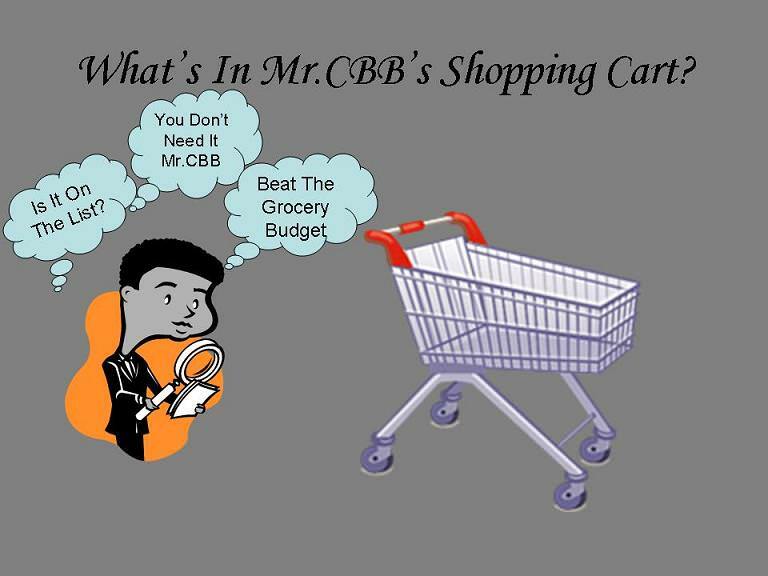 You may be missing an entire grocery bag that you left in the shopping cart in the parking lot, an item at the bottom of your shopping cart or groceries at the cash register. You may not want to go back to get your groceries depending on what it is you left. Then again, you may want to if it was quite a bit of groceries you are missing. If you forgot your groceries in a shopping cart I’m the first to say that you might be S.O.L if you go back because someone might have already scooped up your groceries and took them home. I know there are honest people out there but let’s just say that there aren’t as many as we’d like. I would call the grocery store first before making the trip. Maybe they can send a grocery clerk to the parking lot to check and see if your groceries are still in the grocery cart. The other thing you may want to consider is if you forgot your groceries whether it’s worth it to go back. It may depend on where you live and whether you have time or the transportation to get back to the grocery store. If you are lucky like one of my CBB fans who lives across the street from her local Foodland grocery store it’s a simple trip across the road. Better yet they know her by name so they’d like bring the groceries to her house. If you live far away and all you forgot was $5.00 worth of groceries or a lemon rolled out of a bag on the way out you may have to think about cutting your losses. Is it really worth your time and gas money to drive back to the grocery store? If it was a bag loaded with ample amounts of groceries and you are just across town then sure go back. If it is out of your way you may have to buy the groceries again next time you go grocery shopping unless of course you need the products right away for a recipe. In that case it’s likely best to pay a bit more if you got them on sale to pick them up in town. If your store price matches you could always save a few pennies so the dent won’t be so bad. Have you ever forgot groceries you paid for and did you go back for them? If the grocery store went out of their way for you to make sure you got your groceries what did they do? If you missed any grocery game posts for the month I will post the line-up for the month each week here in this section for you. Congratulations to our May grocery game WINNER…. Joanne T ballot #22. Email me so I can get your prize sent out to you in the mail. Weekly Overview: It was one of those weeks grocery shopping where we thought we’d have no problem staying under budget because we didn’t need much. Boy were we wrong. 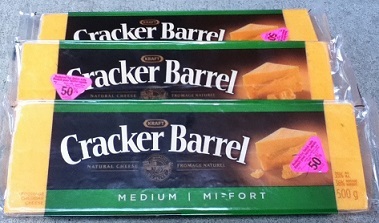 Out came those pink stickers on that Cracker Barrel cheese and we were hooked. Cheese bars cost a fortune to buy at $8.99 regular price. Sure they go on sale often but we love cheese and would hate to have to pay full-price for a bar. So we wiped out our stockpile budget this week and went over a bit with our grocery budget. 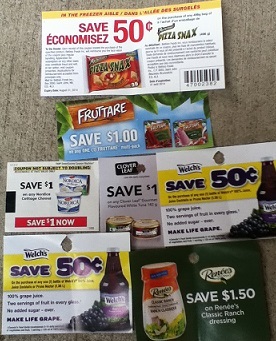 Surprisingly we found coupons around Zehrs and even better during the week they had sample booths around the store which is very uncommon to see. Normally they have samples on the weekends for customers. The best part was the coupons they offer. Although the product tasted good it’s not something we would purchase. I did grab a coupon for you all to see though. It was the frozen pizza rolls. Click the photo to enlarge it. I use MarkO.It is a reminder app and I never forget to buy my groceries again. The app allows you to set up a location based reminder with two options: first you can set a reminder with a category of place as grocery store or supermarket, and second you can set up the specific grocery store, then MarkO will remind you by sending you notification each time you pass by near a any grocery store in the town or if you set up specific store, then in front of it. It helped me a lot with this problem. We were pretty stocked up for most things, so our big need this week was cereal and berries. Cereal we only had two boxes in our pantry, I’m used to having 10-20 boxes since it’s a simple breakfast, getting low is not a good thing which needed to be rectified. Fortunately I lucked into a great sale at RCSS on blueberry pints due to overstock. I bought some the first day and went back day two. We go through blueberries and raspberries like crazy in our house. And, I still wanted to do jam this year, but did a freezer jam instead. The blueberries bought the first day were to consume (and they are in phenomenal shape). The blueberries bought the next day 2.5 pints went to making the freezer jam. The remainder were cleaned up and frozen for baking and smoothies. We go through huge amounts of berries with smoothies, so this was a phenomenal find. The raspberries were great too becoming $1.48 for each 12 oz package. I’m hoping that week two we won’t have to buy too much. The first receipt for blueberries at RCSS should have been .99 x 9 (not the 12). I ended up with a total of 21 pints over the two days. So I am under for the week and even got some meat and garlic bread for the freezer. The ham was pricey but the boys liked it with the salads I left them when I went to London to babysit the grandson. I have gone a fair time with out finding any half price stickers at Foodland but I’m making up for that right now!! Plus they have been on meat that we eat regularly like ground pork and sausages which really help the budget! Looks like I will have a little more time to save up for my strawberries as theatre was saying that the berries will be late this year due to the cold spring we have had. I can handle that, it’s usually picking time around our anniversary (June 25) so a little later isn’t a big deal I my books. I’m quite sure the berries will be worth the wait! It certainly is hit or miss for the half off stickers!!! I grab what I can when I find a good deal that way!! I don’t make pickles here, just jam for now. I used to help my Mom with her pickling back when I was a kid. We made bread and butter pickles, 4 day(think a sweet mixed pickle), pickled beets, mustard beans, dill I think…..and Mom made a relish from green tomatoes that was so good!!! I know I have that recipe tucked somewhere but I haven’t seen it in ages. Worst case there I go to my Dad’s and look over Mom’s cookbooks for it. The green tomato relish was a nice mellow flavour, not a pickle relish. It wasn’t as sweet. I really should dig out those recipes and see what kind of trouble I can get into there!!! The nearest Bulk Barn is in Stratford so it means going out of town. I think it’s on Ontario St. I’ve thought about going there but have to figure out where it is and how to get in there given traffic on that street. I do go to the Country Bulk store in Stratford as my cousin works there and I can get what I want and get caught up with the family news while shopping if Gloria is working. I might try my hand at rhubarb jam since I have another crop ready to go… it’s endless. I might even just give it away as well. I’m not sure yet. What are mustard beans? They sound good. I love homemade pickling of any kind. My wife had a pickled bean in her Virgin Tomato beverage at a restaurant once. She said it was different but good. How many people live in your village? Mustard beans are a yellow bean cooked and in a mustardy sauce, Mom’s recipe was fairly easy from what I remember…. There are roughly 6000 people in town here, might be more now as there are a couple of housing developments going up…. I have a recipe here for a rhubarb jam that uses the rhubarb, sugar and strawberry jello powder, I used to make it back when the kids were small. I always triple check to make sure i haven’t forgotten anything! So luckily I haven’t forgotten anything yet! But i think if i did and it was of a good enough value i would definetly drive back!!! My shop was a bit larger this month as we have pretty much cleared out half of our freezer stockpile! Here goes! I guess this answers my question to the other question I just asked you about where you find the Target coupon booklets. We hardly ever go in the store because the prices were not comparable to other stores. Thanks for the info. By the looks of your past shops you may just get away with that and you can put that money to good use somewhere else. Not all of us are able to do that so well done. I work at a grocery store that keeps a book that we write down forgotten groceries in. If customers call we check our book and they can pick up their groceries or get a refund the next time they are in the store. Thanks for sharing that information Avis. Many people might just write-off the groceries as a loss so that’s good information for them to know. I have my list and look it over before i get as far as the check outs. In the winter the boys come with me to help carry things home but in the good weather I just bring the cart and all home. The odd time I go by myself in the winter and it’s more than I can carry in one trip I will usually call over to the cashiers that my stuff is right here and I will be right back. Never had a problem with doing that. My things are still there waiting for me when I get back for the second run. If I have picked up groceries in town I would have to think about going back. Depends what was forgotten and who it was for. I do try to remember to look the belt over before I leave the store and check the cart before I run it back inside. I don’t ever leave it outside the store…I take it back to the cart spot every time. This is not because I want to get my money back for the cart but have seen first hand in the snow belt how hard it can make things for the poor guy driving the plow to clear the parking lot. He has to stop the truck, get out and move the cart out of the way, not an easy thing to do in deep snow then get back in and continue plowing. This wastes his time and slows him down when he has a number of lots to clear and a limited time to do it. That’s smart of you to look over the belt before you leave. Most people are in a rush and just want to get out and that’s when things get missed. I’m the queen of forgetful. I always forget things so I’m used to making double trips. Especially if I just bought something for sure I’m going back for it. My wife is just like you so we have to go through the list before leaving lol. Hubby and I decided to hold off on our American shopping until our weekend away this month. Since we raided the US Reserves to cover some additional spending in May, we are now focusing on replenishing the US Reserves for shopping later this month. It’s another good week for rain checks! We picked up another one for assorted Coke & Pepsi products 2L bottles priced at 5 for $5 to a maximum of 10 bottles. Mixers are great to have on hand in the summer especially when it’s hot and you are breaking out the barbecue! The treats we got this week (ice cream, pizza and potato chips) were a little tough on the budget but that’s okay because I expect next week’s spending will only be for a jug of milk. So, if you look at the $1,670.74 calculation that we have spent in 2014 and subtract the $250.00 we have actually saved in our “reserves” and the $159.42 we have recorded as spent but is actually set aside for future USA grocery shopping… we have actually spent $1,261.32!! That is $121.32 over the $1,140.00 we budgeted for January through June. Fortunately we have 6 weeks of vacation time still coming in 2014 when I use our “vacation funds” instead of the “grocery budget”. That’s a dollar value of $285.00 so that $121.32 will easily be absorbed and we’ll get back on track so long as I really watch the spending for the balance of the year! The pop bottles are from our consumption. We have bags in the garage and when we have 100-200, we take them in. It takes forever to save that many. We don’t drink alcohol or caffeine in the evening so we do have drinks like Sprite Zero and Fresca. No… the pop bottles are plastic. We pay a deposit when we purchase them and they refund the deposit when you return them to the recycle depot. As far as the meds go, I don’t know… we tend to buy 1 of each (except my Equate pain cream and then we buy 2). We get HUGE bottles for less than we pay for a small one. I carry my groceries back on my bike. If I forget something, it’s just more exercise. So, yes, I always go back! Yeah, for us it would totally depend on what we forgot, since the grocery store is nearly 15 miles away. I might be tempted to call up there though and talk to them and ask them if we could work something out since coming back that day is such a pain. I bought a case of potato chips near Halloween. I left them at the bottom of the conveyor. They were waiting for me when I went back! But once I left a large pack of bathroom tissue under the cart and it was long gone. I wouldn’t go back for small items or a small amount.